The arts have always been a part of my life. When I was a child, I would write down pages and pages of ideas for novels. I would spend hours creating characters and writing excerpts inspired by them. It got to the stage where for many years, notebooks were the only gifts given to me for my birthday. I would also draw the things that made me happy – beautiful animals and costumes for ‘older Meha’ to wear. It was a lot of fun. 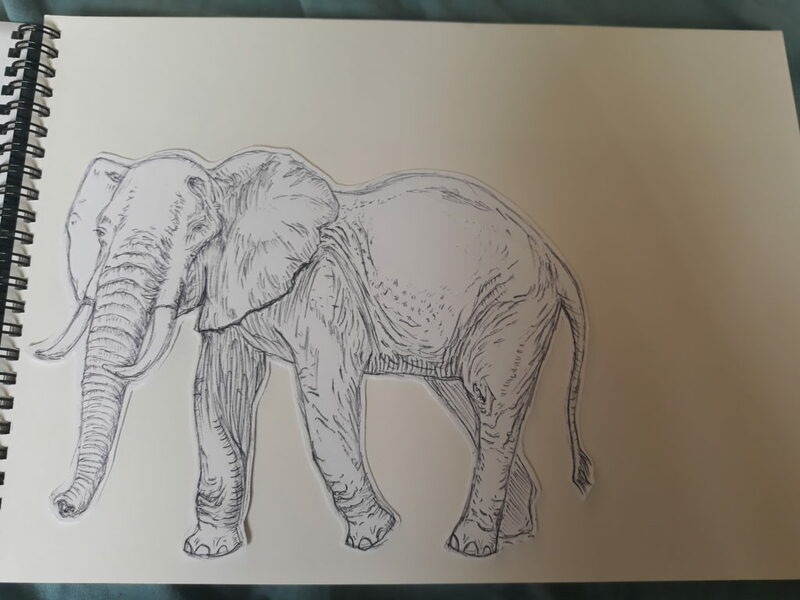 An elephant drawn in 2011. I have always loved animals, and this shows in my artwork. My sister praised my dedication to drawing and writing, and my parents entered me into competitions, some of which I won. As I got older, although my parents were proud of my passion, they encouraged me to focus on academic subjects like the sciences and maths. With both my parents having stable careers based in healthcare, they wanted me and my sister to have the same security in the future. I listened to them and started to see healthcare as my future. Soon, writing and drawing were confined to the times when I was feeling blue and wanted to be comforted by an old friend. As time went on, my sister achieved admission into medical school, and we were all ecstatic! I looked up to my sister and seeing how happy she was, I wanted to follow in her steps. I achieved the same good GCSEs as her but as I progressed onto college, I started feeling differently. Teenage years are a difficult time for almost everyone, and I was no exception. Just in my case, I started getting quite ill. I didn’t know at the time, but my mental health was slowly deteriorating – I started to find myself becoming a lot slower at doing basic tasks – like brushing my teeth and showering, until, I sometimes went days without doing either. I spent as much time as possible sleeping. I just didn’t want to wake up – the days were too long and draining, and sleep was my only escape. I didn’t really understand what was happening – I just thought that I was lazy and often chided myself. I struggled to find the motivation to do anything – it was difficult to function, and I would just sit for hours staring into space. My parents could see the change in me as I rarely smiled or laughed anymore. They took me to the doctors, where, after many tests, the doctors diagnosed me with depression and anxiety, and I started taking medication. My family took time to adjust – they had never experienced someone close to them having mental health illnesses. My family did everything they could do to help; they went shopping with me to buy nice smelling soaps to motivate me to shower. They spent hours playing board games with me just because it made me smile once or twice. They did everything they could to stop me from feeling numb – they reminded me of my childhood passions: literature and drawing. It was difficult for me concentrate long enough to read or write but I was able to occasionally draw. 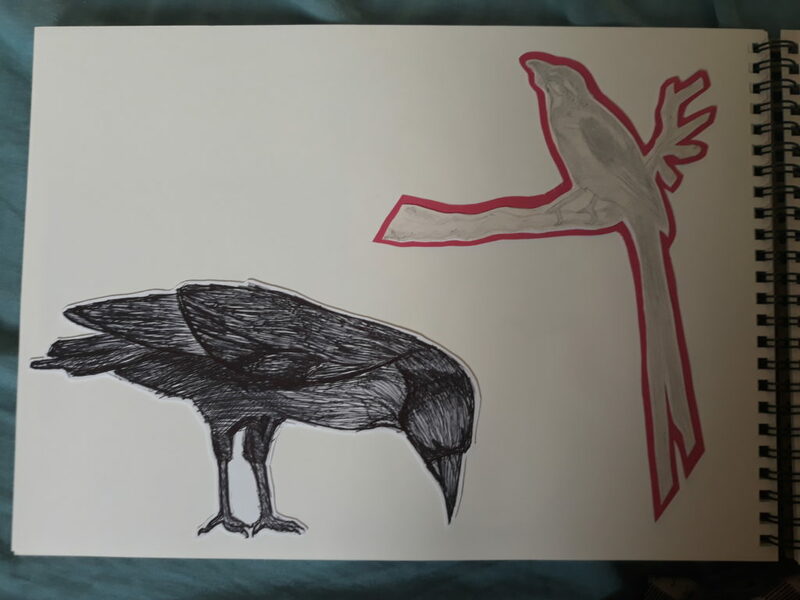 Drawing helped me to communicate when I didn’t have the words. 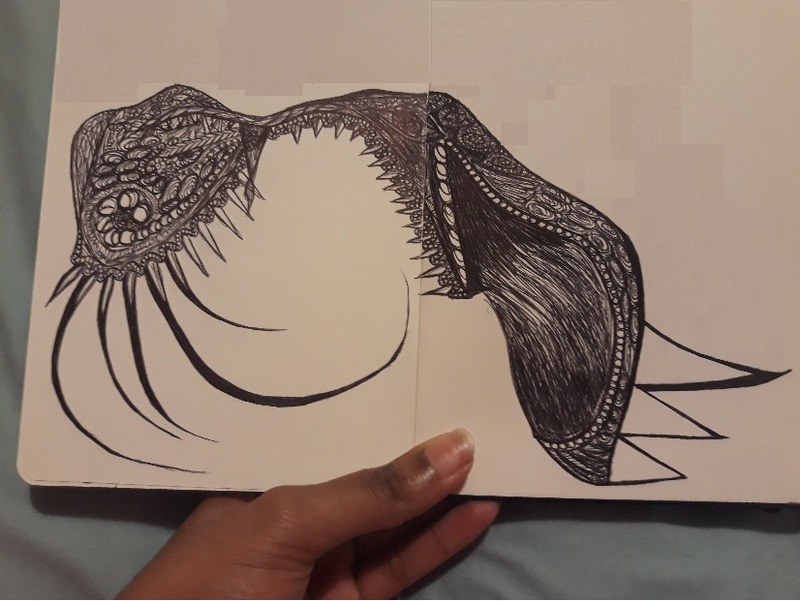 Once, I drew a monster to show my sister why I was struggling and afterwards, I felt a sense of peace that I was able to compress everything I was fighting into a drawing. Drawing also gave me hope – I drew outfits I wanted to sew, and it led to me learning some embroidery stitches. The monster I drew. There was a time when I couldn’t look at this drawing without feeling sad, but I’m happier now knowing that, now, it is a lot smaller and manageable. My family recognised that art was helping me to come back to them. They started looking for art courses based locally and encouraged me to apply. I didn’t have any artistic qualifications to present and so, for the interview, I created a portfolio of small pieces of art I had created many years ago. We were all ecstatic when I was accepted onto Level 3 Art and Design. After starting the course in September 2018, I have learnt a lot about myself and even progressed onto the second term with the help of my family, friends, teachers and counsellors. The medical assistance I have received has been a lifesaver and without it, I would not be where I am today. But art has helped me in a way that medical professionals could not; art has allowed me to feel again.